Couldn't have asked for more, musicians were excellent and all of our guests enjoyed the live music. Communication was always prompt and very helpful during the planning process. The Accordia String Quartet was delightful. My contact in San Francisco was responsive, flexible, and professional. As the mother of the groom, I did not get to hear their full performance, but what I did hear was lovely. Amazing amazing amazing!! The musicians played beautifully at my wedding. Highly recommend booking accordia music! We wanted to have a string quartet at our wedding but wasn’t sure it was affordable or just overall how to make it happen. We ran across Accordia Music and were pleasantly surprised that it seemed affordable. We reached out and asked many questions which were always answered in a timely matter. I greatly appreciated the communication factor. We moved to Nashville during this process and at times the distance to San Francisco made it hard, however Accordia was clear in what they needed from me and that was helpful. We got to chose all of our music we wanted but other than the ceremony really let them choose. Our guests really loved the component of a string quartet! Easy to work with - beautiful, fun music! We had the pleasure to work with Mariana to plan and play at our wedding. Mariana led a four string quartet. The planning with Mariana was easy. She and the quartet were, punctual, very professional, and the music was beautiful. She exceeded our expectations. We absolutely recommend Mariana and the Accordia team! Marianna was very responsive and the music was great! Accordia music was great to work with! They were able to do all of our song requests. The woman we worked with was easy and very responsive. They showed up on time and everyone loved them! Mariana was great to work with, she answered all our questions immediately . The string quartet was absolutely amazing. It really made our wedding thay was at a rustic outdoor gazebo. Everyone was extremely professional and did an amazing job! I would highly recommend them to anyone! Overall great experience.....the group added alot to our wedding. I chose Accordia for their pop and modern song repertoire and they did no disappoint. Such a pleasure to work with and received so many compliments from wedding guests. Their music set such a romantic and wonderful ambiance for the ceremony that I was hoping for. Christina and the musicians of Accordia Music were fantastic. Christina was extremely easy to work with. Accordia's music repertoire was vast so we had a ton of music to choose from. 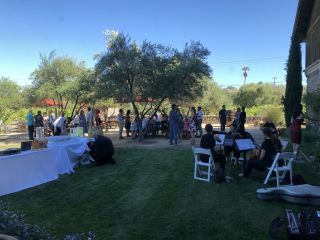 The music created a wonderful atmosphere at our ceremony helping to entertain our guests when the wedding party was slightly delayed. I'd highly recommend booking them for your event. The music really enhanced our day and helped make it feel that extra bit more special. 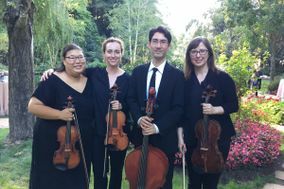 I had accordia music's string quartet play at my wedding ceremony and everyone loved it. They are super easy to work with and have tons of song choices. Their music adds an extra layer of elegance! Accordia Music was absolutely amazing! Their string quartet played for our wedding ceremony and cocktail hour in Youngstown, Ohio, and we couldn't have been happier. They were a pleasure to work with leading up to our big day, and they were always extremely professional, excited, and helpful. Their beautiful music helped to make our wedding day perfect, and I will forever remember it. We received countless compliments on their talented musicians, and the priest who officiated our wedding even commended the quartet for their gorgeous work at the end of the ceremony. We can't recommend them enough! Accordia Music team was top notch from the initial email response to our big day. Christina was responsive, enthusiastic and accommodating and the team's music was beautiful (evident from the website as well as in person) and a true highlight for our ceremony and cocktail hour. Thank you so much! We hired a string trio to play during our wedding ceremony in Cleveland, Ohio. Accordia Music was very responsive to emails and offered a large selection of music. The trio was a beautiful addition to our ceremony- many people commented on how much they loved music! I highly recommend Accordia Music if you're looking for a way to make your day extra special. Thank you for making our wedding even more memorable! I cannot recommend Accordia Music enough! Mariana was always quick to respond to any questions that we had. Very easy to work with and organize! The day of the wedding, the violinist (I'm sorry I forgot her name :/ ) popped her head in the party bus to check in on us and make sure that everything was in order! I felt that that was very kind and thoughtful of her! The music sounded wonderful, even guests commented later! We have passed on this recommendation to other brides! I highly recommend Accordia Music. Christina was a pleasure to work with. I had complete confidence in her from the beginning which is crucial with wedding vendors. She was extremely helpful - from looking over my chosen song list and giving me feedback on what would work best to helping facilitate an arrangement of a song which had personal meaning to my fiance and me. And, she did all of the above with a cheerful demeanor. Thank you Christina! Accordia Music was one of the best choices I made at my wedding! We had such unique ideas of how we wanted our ceremony to go and they made them all happen! They sounded perfect and we received so many compliments. Guests had a blast trying to guess which fun movie songs we picked! They were flexible on the day of and I would highly recommend them to any couple looking to add a little extra flair to their wedding! Accordia music was very professional and talented making the wedding day stress free. We had Accordia's string quartet play for our ceremony and cocktail hour at Stambaugh Auditorium. We communicated by email to coordinate our music choices and timeline- Mariana was incredibly helpful. The music was absolutely beautiful and made our ceremony perfect. Our daughter's perfect wedding would not be complete without walking down the aisle to Pachelbel's Canon in D with me. This beautiful quartet made our dreams come true. In spite of miserable weather, the outdoor ceremony felt perfect thanks to their performance throughout. They also played throughout the cocktail service inside. The venue was The Barn on Enchanted Acres -- acoustics for light classical music not optimum, but their selections made us feel that we were transported to an enchanted place. In addition to the excellent performance, the four members were gracious and personable throughout. They arrived in plenty of time to set up, and did a great deal to keep the bride calm and confident.